Positional strategy is only half the battle in chess. But it takes chess tactics to gain the upper hand. You can have an overall long term game plan. But you can also look for three to four move combinations that will forcibly damage your adversary. These combos are designed to create mating attacks, win material or in some way improve your position. As you get more experienced you will spot opportunities to spring these combinations on your opponents. These ideas come in many forms. The common theme is subjecting your opponent to a double threat or even multiple threats. He is forced to choose the least bad outcome from the menu. These plans are called chess tactics. One sucker punch you can land on your opponent is the fork. Any piece or pawn can fork two enemy pieces. The most notorious is the Knight, well known for forking a King and Rook. It's really a double attack. You attack two pieces at once. Your opponent can only keep one of them, he will save the more valuable one. Then you take the remaining piece. The reason that the Knight is especially adept at this is probably his unique move. When the Knight attacks a piece (other than an enemy Knight of course), that piece cannot take the Knight. Another good idea is to pin pieces to the spot and build enough pressure on them to take and win the exchange. If you attack a piece it may be moved elsewhere to avoid capture. But if there is a more valuable piece behind it which would then be hanging, this piece would be forced to sit tight. In other words the piece would be pinned. There are two ways you can get an advantage by pinning pieces. First off it's a great way of slowing up your opponent's plans. You can slow down his development, cramping his pieces, locking them down. And secondly you can build up enough pressure on the pinned piece. If you can get more of your forces attacking it than your opponent can get defending it you can take it. The discovered attack is another doozy that can be waiting on the end of a combo. This is when a piece is moved to attack an enemy piece. The magic in this trick is that when the first piece is moved it also opens up an attack by one of it's comrades on a second enemy piece. The more valuable enemy piece must be protected leaving the secondary piece to fall. Very often a King is put in check with this idea and when he flees the other piece is taken. In this example the Black Bishop is moved to b4 checking the King which must be protected. The same move from the Bishop has opened up the line between the two Queens. When the King's survival is secured the unprotected Queen is left to perish. The double check is a deadly assault on any poor King that feels it's wrath. It's potency comes from the fact that the only way to deal with the check is to move the King. Since he under attack from two enemy pieces, blocking does no good as it only stops one check. Taking the attacking piece is no answer for there are two attacking pieces and he can take only one. So the King must flee. You can rob the King of castling rights and trap him in the center. But there are other things that make the double check a fearsome weapon. Since only the King can move you are effectively freezing his whole army. Therefore if you can attack any other piece as you launch your double check, that piece would be hanging. A skewer is sort of the opposite of a pin. This time the target is behind the more valuable piece that gets attacked. The stronger piece has to get out of the way to evade capture leaving the hanging piece to be taken. This is a trick that the Knight cannot perform due to it's move. It's a maneuver that is performed by long range pieces such as Bishops, Rooks and Queens. The diagram shows a Queen being skewered by the White Rook. The Queen must get out of the firing line leaving the Black Rook on the home rank vulnerable. Your instincts for spotting potentially vulnerable enemy pieces will grow quickly if you work on it. Undefended pieces, pieces in dangerous cul-de-sacs on the board. When you see a possible victim you set your forces in pursuit, constructing a net. Try to do this as discreetly as possible. Disguise your intentions as best you can. Every time you move your opponent should be asking himself what your intentions are. If your intentions are only to trap his piece he should be able to figure that out quickly. This is another reason why multi-purpose moves are so powerful. If he sees one or two other reasons for your moves he might overlook your intent against his piece. If he doesn't twig what you're up to as you cut off all avenues of escape you can spring the trap when everything is in place. The patterns of various tactical shots will form in your mind over time. You will begin to see possible opportunities on the board during your games. When your opponent's pieces are lined up for pain a little light will go off in your head and you will spring the trap automatically. Flags will also go up in positions where almost everything is in place. A position is just ripe for a tactic but you need one of his pieces to be on another square. Don't curse the darkness, light a candle. You only need to work out a way to compel him to move the piece in question on to the hot square. Such a compulsion is called a chess decoy. Zwischenzug is a subtle but deadly interjection that has decided many a game of chess. It is a German word which translates directly as intermediate move. Such a move is also referred to in chess as an intermezzo. The way a zwischenzug or intermezzo works is it interrupts an apparently forced combination like White takes, Black takes, White takes, Black takes and so on. In the middle of all this you can introduce an intermediate move. This intermediate move threatens disaster and must be parried immediately. It's basically winning a tempo getting the intermediate move for free. You can then proceed with the combination having got in your extra and often decisive move. Another thing to watch closely as the middlegame wears on is the back rank. 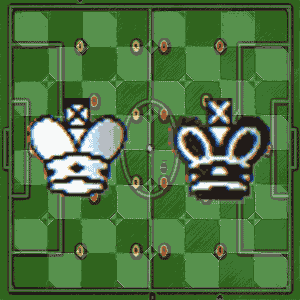 Many times both players are trying to advance their attack before the other. Both players are acting and reacting. Time is of the essence and there is so much to do. So many urgent tasks that need to be completed. It is surprising how often that the back rank gets neglected. The King has no space to breathe, no escape square should one be needed. Sometimes a player will even say to himself for 10 moves on the trot, if I could just find the time to push that h-pawn. And sometimes they just never find the time. So you have to ask yourself. How can I take advantage of this weak back rank? Everyone likes to play a daring sacrifice and force a win soon after through the positional compensation. But what is the right price for a piece? What positional gain would we like for a minor piece or even a Rook? Complete destruction of the pawn shield in front of the King sounds like a good deal to me. You would need to have your remaining pieces poised and ready to move in and finish off the King quickly. Don't want that sucker escaping the open corner. If he does you're simply a piece down for nothing. So make sure that your Queen or Rook is getting there quick with the support of all your remaining pieces. The game should then be brought to a swift end. Can you think of a more satisfying way to win than to conduct a successful King Hunt in the middlegame. This has been done not only when castling has been neglected but also after castling! Imagine thinking your King is nice and safe and then watching in horror as his cover is ripped away. Bad enough but then he unceremoniously marched from one end of the board to the other. All this is done by repeatedly checking the King. He is compelled to march forward as all retreats are systematically cut off. The enemy camp is a cold house for a lonely King in the middlegame. He doesn't last long. Often when you have the initiative you will find yourself on the point of victory. And yet you can't quite finish the job. Your opponent has one key defender holding his position together. Can there be anything more frustrating? Luckily there is a solution. Destroy the key defender or force it to move. Then it's over. There can be nothing more psychologically destructive than the Chess Windmill. This tactic is based on the power of the double attack with incessant tempo gains through perpetually checking the enemy King. The wonderful thing is while your opponent is forced to move only his King you are feasting on his defenseless army. Any pieces lined up on the rank in question will be swallowed up by a ravenous Rook. And it is not just the Rook who can repeatedly inflict these discoveries on the poor King. Knights can do it too, picking off enemies within it's octopus-like reach. Chess Tactics: Chigorin - Yankovich, 1899, White has just played 31.Ba7+! At first it looks like Black can just take the Bishop but his King cannot move or the pawn will promote, also the a1-Rook is protecting the Bishop by means of an X-Ray and will take the Rook after the Bishop is taken. After 31...Rxa7 32.Rxa7 Black resigns. The X-Ray is really taking advantage of an optical illusion. Pieces can attack, threaten or protect squares or pieces that they don't appear to be. X-Rays are performed by long-range pieces; Bishops, Rooks and Queens. We may think they are only attacking the first enemy piece standing in their way. Or we may think that if they are blocked by one of their own pieces they are not exerting influence on the entire rank or file. They are however and every enemy piece on that rank or file can feel their pressure. You can be attacking a square with two pieces and it looks like only one piece. This can cause your opponent to miscalculate the position and make a mistake. The clearance sacrifice is another great tactical idea. Sometimes when one of your own pieces is blocking a winning combination the best way forward is to sacrifice it. You need the square it sits on. You don't want to lose a tempo and the initiative. So you move the piece in such a way that it forces a parry. Now you have opened the road to a mating attack without losing a tempo. A clearance sacrifice can in most cases be considered a positional sacrifice. You are giving up material but achieving a much better position. This is very often done by force. Add a potent tactical threat to your solid positional skills and you certainly will be a player to be respected, even feared by your peers. Practice tactics daily. Is there anything else you need to know in the middlegame? It just so happens that there are some common thematic ideas that are played in a wide range of middlegames. Technical know how on such things as minority attacks, Queenside majorities, blockades, weak square complexes and more. It's always handy to know how to play against all kinds of pawn formations and how to target isolated pawns, backward pawns, doubled pawns, hanging pawns and the like. Brush up on your chess motifs.